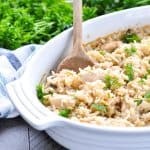 This Dump-and-Bake Chicken and Rice Pilaf is an entire dinner that cooks in one dish! Full of zesty seasonings, fresh herbs, and crunchy almonds, it's a satisfying and cozy meal for your busiest nights. 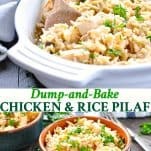 This Dump-and-Bake Chicken and Rice Pilaf is an entire dinner that cooks in one dish! Full of zesty seasonings, fresh herbs, and crunchy almonds, it’s a satisfying and cozy meal for your busiest nights. 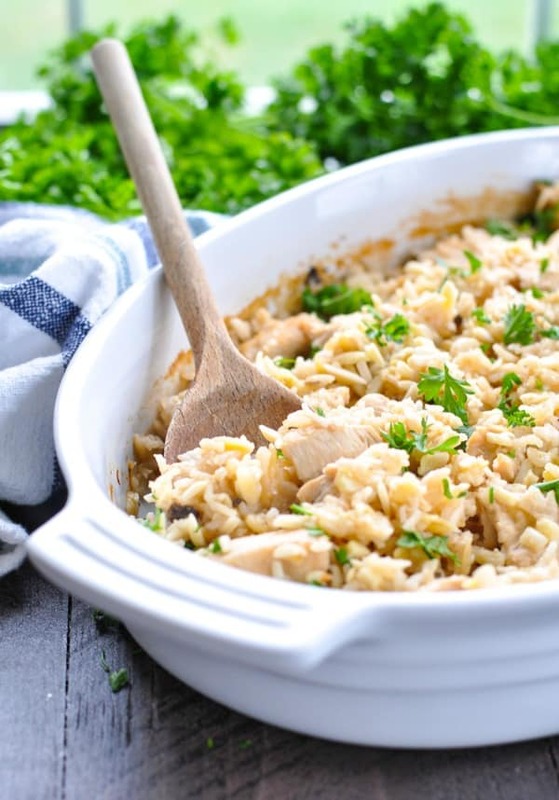 That’s right, my friends…I’ve taken my favorite dump-and-bake method and I’ve turned it into a delicious and easy Chicken and Rice Pilaf casserole! 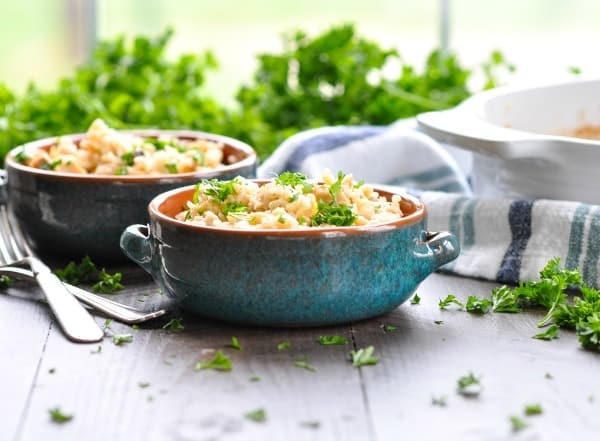 If you’re looking to switch up the boring old dinner routine (while still keeping it super-fast), then this is the recipe for you! 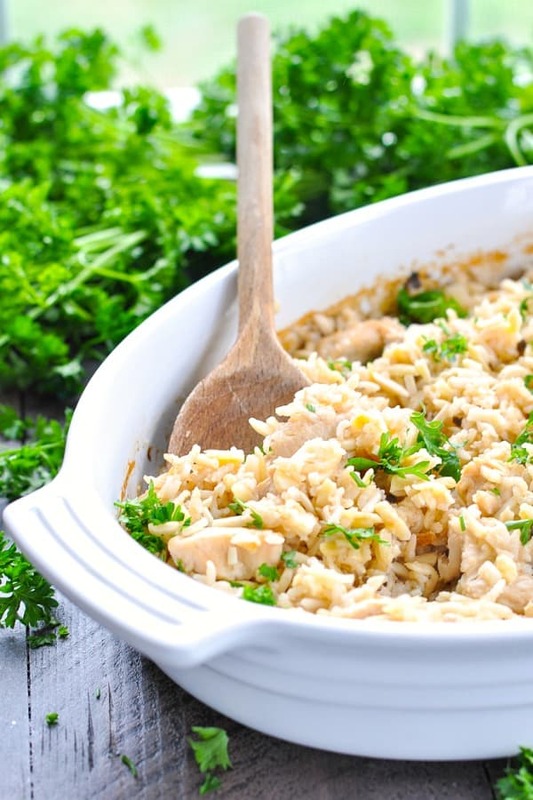 Are you a big fan of Rice Pilaf? I feel like it’s one of those lesser-known side dishes that has kind of been forgotten over the years. 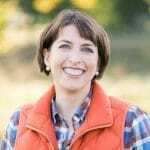 After all, in the hustle of the daily grind, most of us aren’t interested in preparing a multi-course meal with fancy sides. Instead, I’m looking for the quickest and easiest way to get a relatively healthy supper on the table before my children fall at my feet complaining of starvation! Needless to say, the last-minute scramble doesn’t typically involve the preparation of Rice Pilaf…unless it comes from a Rice-a-Roni box! Until now, that is! 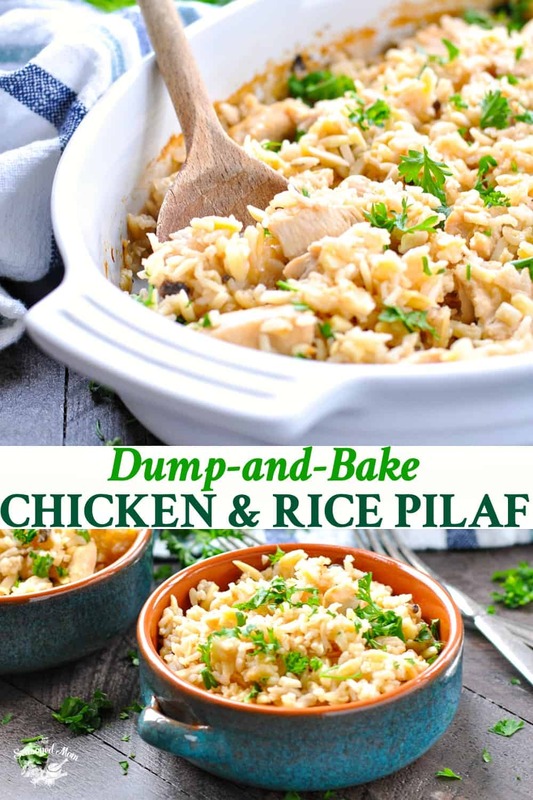 This dump-and-bake version of Rice Pilaf only requires 10 minutes of prep, and the chicken cooks right in the dish! That means that your average Rice Pilaf side dish has now been elevated to entree status, thanks to the addition of meat! 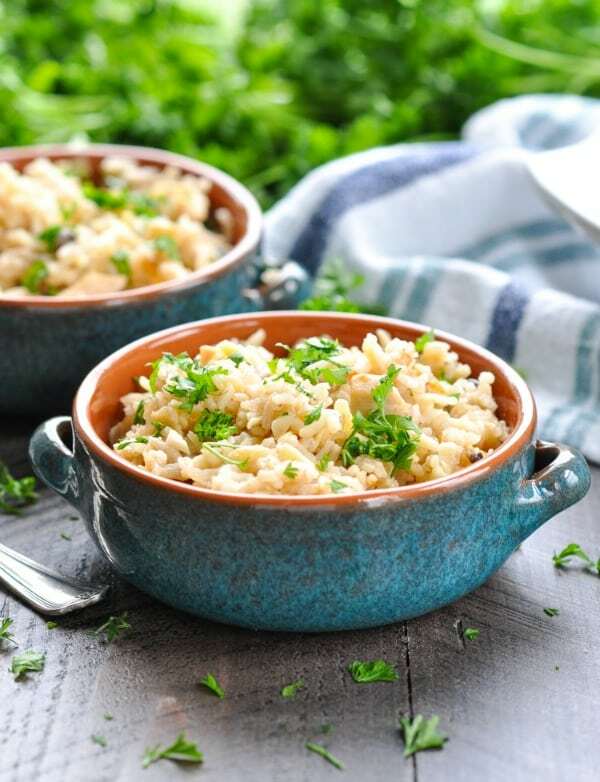 Traditional Rice Pilaf just refers to a dish in which rice is cooked in a seasoned broth, often with onion, sautéed veggies, or added spices. 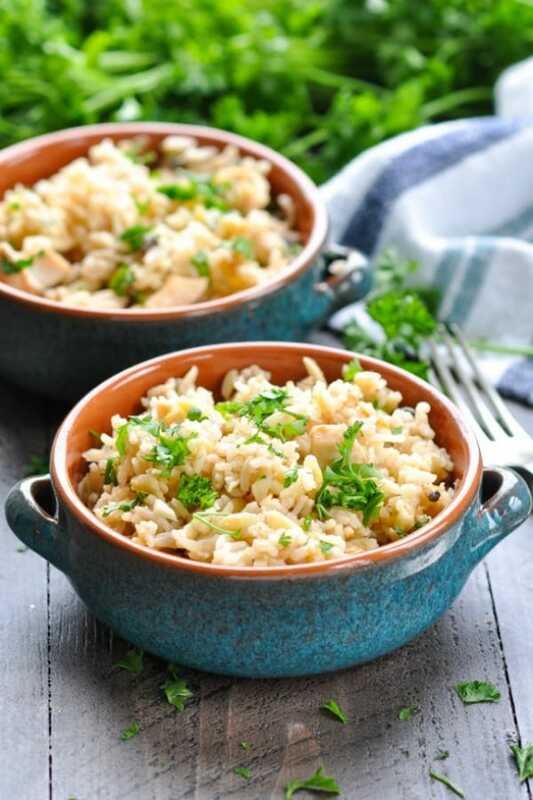 My Rice Pilaf cooks in a seasoned broth as well, but it includes orzo pasta, diced chicken, slivered almonds, and fresh herbs for a delicious twist on the classic! 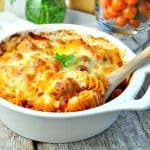 Best of all, everything cooks in one casserole dish! That means that you don’t have to stand at the stove sauteeing vegetables, stirring a pot, or watching your rice boil. Just stir all of the raw ingredients together, pop it in the oven, and your job is done! In a large bowl, whisk together mushroom soup, chicken broth, sherry, and dry onion soup mix seasoning until completely combined. 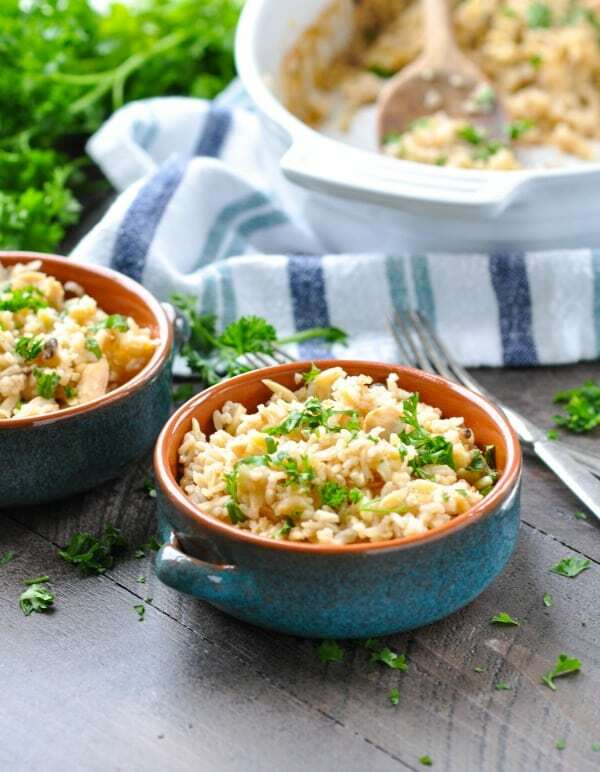 Stir in diced uncooked chicken, uncooked rice, and uncooked orzo or vermicelli. Pour mixture into the prepared baking dish. Cover tightly with foil and bake for 30 minutes. Remove from the oven, stir, and cover again. Return covered dish to the oven for 20 more minutes. Remove the foil, stir the rice again, and then sprinkle the top of the dish with Parmesan and almonds. Return the dish to the oven, uncovered, for about 5-10 minutes, or just until almonds are toasted, rice is tender, and chicken is cooked through. Fluff with a fork, garnish with chopped fresh parsley, and serve. 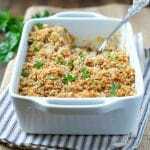 I love to serve the Rice Pilaf with something green on the side, such as a salad or steamed broccoli. 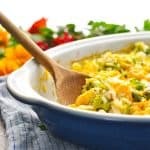 If you don’t even want to fuss with that, you can certainly add some veggies right into the casserole dish before it goes in the oven! Try frozen peas, frozen mixed vegetables, or baby broccoli florets. 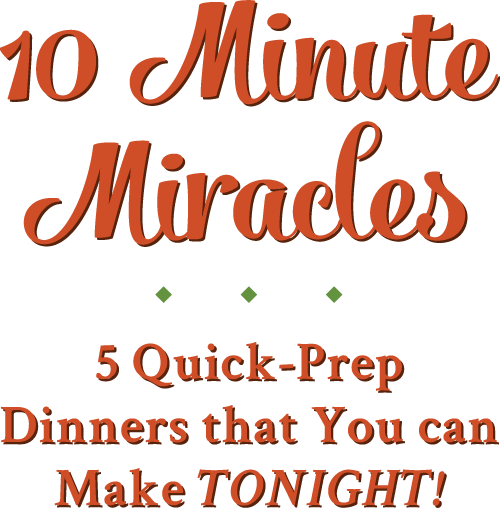 It’s a one dish meal that the entire family can enjoy, and it’s about to make your last-minute weeknight dinners a whole lot tastier! Uncooked rice, orzo or vermicelli will all work well with this recipe. You can also use leftover cooked chicken, turkey or ham in this recipe. Feel free to add extra veggies such as mushrooms or bell peppers. Cooking Just for Two? 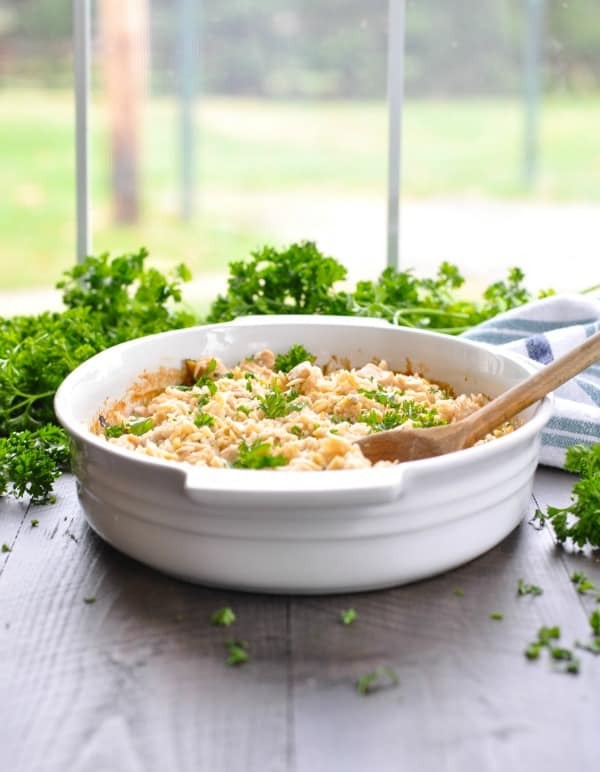 Cut the ingredients in half and prepare the rice pilaf in an 8-inch square baking dish. The cooking instructions and time remain the same. To make this gluten-free stick to rice only or go for gluten-free pasta and stock. I recommend using long grain rice for this recipe such as basmati. Return the dish to the oven, uncovered, for about 5-10 minutes, or just until almonds are toasted, rice is tender, and chicken is cooked through. Fluff with a fork, garnish with chopped fresh parsley, and serve. I love pairing chicken and rice together! It’s one of my favorite combos and I’m always looking for new recipes. Love the cream of mushroom soup and Parmesan in here. Sounds like the perfect meal! Thanks, Gayle! I agree — chicken and rice together are a perfect combo! I used Campbell’s cream of ‘shroom with roasted garlic soup. It has just the right amount of roasted garlic to make anything you use cream of ‘shroom soup for even better!! That’s right — I always forget about the roasted garlic version. Great tip! 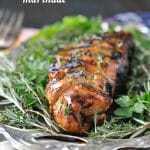 Hi Blair this recipe sounded so delicious i decided to try it! Its now in the oven! I am keeping my fingers crossed that there is enough liquid in the dish – to me it looks really thick and lacking in moisture. But you have never let me down yet so here goes. Will keep you posted!